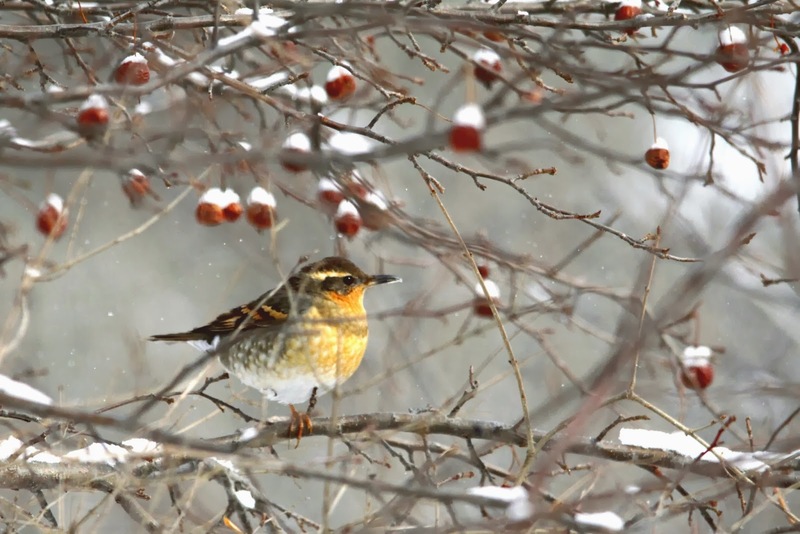 A female Varied Thrush in Guelph, Ontario. One of the things I love about birding is the fact that there is always new stuff to learn, not just new birds to see. Like birding terms for example, who knew there was a whole other vocabulary out there for us birders?! Rob and I twitched this past Sunday, and we dipped as well. Confused? Let me explain. Here are a few definitions of birding terms. Twitch – v. To seek out a previously reported rare bird, generally traveling long distances to do so. Related forms: Twitching, verb. Twitcher, noun, one who twitches. Dip - 1) v. To travel to attempt to see a previously reported rare bird and fail to see it. 2) n. The actual bird that one has missed. Related forms: Dipped, verb. 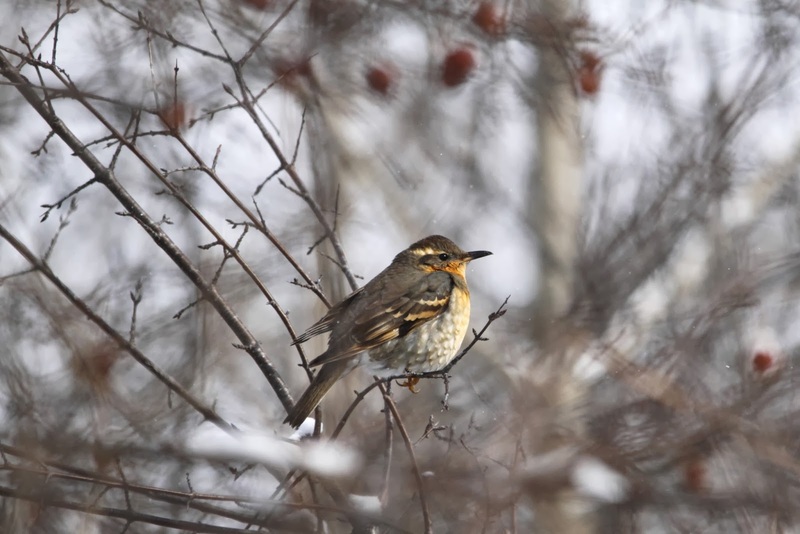 Reports of a Varied Thrush in Guelph, Ontario had us all twitchy to go see it, and we did this past Sunday. Our birder friend, Dave, joined us, even though he had made the trip to see it the day before. He's twitchier than us. While we were there, other birding friends, Jim and Lynda arrived as well. They were twitchy too! She flew up to the crab apple tree four times to eat in the 45 minutes we visited. As you can see from the map below, borrowed from the All About Birds website, this Varied Thrush was far away from her usual range. It was a real gift to see her. She had lots of food and shelter where she was, and I hope this fairs her well. Rob and I have only really "twitched" four times in the years we've been birding, and we're two for two. We dipped on a Smew, and Thick-billed King Bird, but we were able to add a Western Grebe and this Varied Thrush to our life lists, thanks to their visits. We were hoping to see an owl or two on our Sunday outing as well, but we dipped. This doesn't happen to us often, as we usually don't have a particular bird in mind when we go out birding. No matter, we still had a good time. Wonder what rarity will make us twitch next?! Great post! Good to learn about new things. Wow, that Varied Thrush is gorgeous! I'm happy you got to go see it. Sweet! The last time I twitched was with the Great Grey Owl in Kingsville. It was only 50 minutes away and worth the trip.